Home News & Stories African Youth Are Making Their Voices Heard! African Youth Are Making Their Voices Heard! 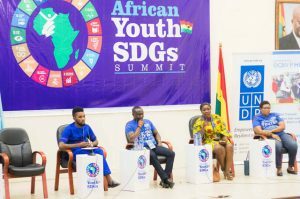 Melton Fellow Kwabena Ankrah represented the Melton Foundation as a panelist at the African Youth SDGs Summit 2017. He talked on how young people today can be prepared with relevant skills to fit into the job market with a focus on the importance of Global Citizenship. “The African Youth SDG Summit granted me an amazing opportunity to learn and connect with some of the brightest minds on the African continent and beyond. 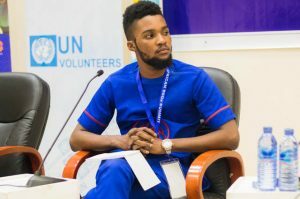 The event also gave me a huge platform to contribute to the intellectual discourse on sustainable development through global citizenship in a world in flux,” says Melton Fellow Kwabena Ankrah after representing the Melton Foundation as a panelist at the African Youth SDGs Summit, November 1-2, 2017. For him it was an extremely inspiring and heavily packed event with over 250 brilliant and exuberant young delegates from over 22 countries in Africa coming together to contribute towards building a better Africa. “The Sustainable Development Goals (SDGs) are not just about people. It’s about life. Life on land, in water and in the air. It’s about being aware of the harm that we as human beings have done to our environment and being responsible enough to take innovative but sustainable and environmentally friendly initiatives to undo the harms we have caused. In taking these bold initiatives in a complex world of digitization, automation and globalization, there is a need to obtain globally competitive skills. Institutions like my school, Ashesi University, and amazingly unique global platforms like the Melton Fellowship which gives lifelong global citizenship appointments to young change makers across the world, empower youth to be global problem solvers and internationally competitive and desirable young graduates. These institutions provide us the learning goals of ethics and civic engagement, critical thinking and quantitative reasoning, cultural and emotional intelligence, teamwork, innovation, technological competence, creativity, action, professionalism and give us platforms to have an international experience and global exposure. The African youthful demography is the most powerful, silent force on the continent. The continent has the youngest population in the world with a median age of 19.5 years according to the UN. With the youth empowered to recognize their voice and worth, we can cause a wave of positive change on the continent that has never been seen and felt before and break the dubious political machinations fueling a leadership gap between the leaders and the led. You know there is a problem somewhere when the average age of the ten oldest African leaders is 78.5 compared to 52 for the world’s ten most developed economies. With a booming youthful demography at the bottom, the political top in Africa is a disturbingly graying lot. We youth need to change this in order to end the old and out of touch leadership syndrome. Africa needs more well-informed youths who are mavericks, weirdos, and crazy out-of-the-box thinking radicals who do not just passively nod to retrogressive social norms and constructs but boldly question leadership, rules and systems. First, we need to identify the technical skills needed in the classroom in each major and in the ways used to teach them (teamwork, project work, internships, applied research etc.). Second, we must identify all the other “power skills” and “soft skills” given in and outside the classroom to effectively apply the technical skills through things like: the provision of internationally diverse communities which offers young people with multiple opportunities to engage and deal with difference and learn from them. The two-day summit provided a platform to amplify the voice of young people across Africa, showcase innovations and offer policy advise in order to increase youth participation in the implementation of the SDGs. Discussions spanned across various thematic areas such as environmental management, gender, disability, economic and social development. Click here for the summit communiqué summarizing the key insights from the discussions and help create the Africa We Want!